If you missed the announcement, make sure to check out the all-new AHLTV. It’s a whole new way to watch the AHL with a lower price point, new technology, and more. It’s a must have for a Bears die-hard. I’m headed to the Washington Capitals Prospect Showcase in Estero, Florida this weekend. I’ll be on the broadcast of the Capitals games with former Bears legend John Walton. Many of the players on the roster are players who skated in Hershey last season, or players who will be skating with the club this season. I’m excited to see what these guys can do. You may view the whole roster HERE. Washington’s training camp is set to open on Sept. 14 and Hershey’s 10 days later on Sept. 24. When is season ticket holder pick up night? Stay tuned for more information, but look for this to be Wednesday, Sept. 26 at the Giant Center. We can’t wait to see our loyal Season Ticket Holders soon! What happened to Star Wars Night? Hopefully something will be announced soon regarding a few additions to the promotional schedule. STAR WARS Night is something that takes a bit to get approved. However, my sources tell me we should see STAR WARS Night this year in Hershey. Stay tuned! Who is the favorite to get Captain C and alternates? And what do you listen to on the bus/ traveling with team? With a new coaching staff, and all three of last year’s captains departing, it will be interesting to see how this plays out. The most obvious choice to wear a letter is defender Aaron Ness. He wore the “A” at times last year, and was a two-year captain in Bridgeport. I’d guess he is wearing a letter of some kind. Troy Mann told me in the past he thought Liam O’Brien had the makings of being a captain. I love the work Liam has put in to become the player he is, and he’s a guy that is loved by his teammates. He’s one of the more tenured Bears on the roster, so I wouldn’t be surprised to see him with a letter myself. Jayson Megna wore an “A” in Utica and was a captain in juniors. If he’s in Hershey, Nathan Walker has the experience and attitude that a leader needs. Any other veterans brought in could certainly warrant a letter as well. As far as what I listen to on the bus, Spotify is amazing to help pass the time. I’m all over the place with my musical tastes, with current alternative rock/pop, as well as classic rock being my favorites. I usually listen to something more upbeat after a Bears win. Which prospects in the system do you think have the best chance to make the opening night roster in Hershey? I do think the good majority of the Capitals top prospects will be with the Chocolate and White this year. Of course, this excludes recent draft picks like 1st rounder Alexander Alexeyev, who are too young to play in the AHL and will return to major juniors. Goalie Ilya Samsonov is likely the Capitals’ top prospect. He should be in Hershey, splitting time with Vitek Vanecek as he adjusts to North America. At forward, Shane Gersich is the biggest name to know. He could be in Washington, or he could play in Hershey depending on how training camp shakes out. He put up great numbers at North Dakota, and was good in his stint in DC last year. However, it would benefit him to get top-line minutes in Hershey rather than 4th line minutes in Washington with their depth. Garrett Pilon and Axel Jonsson-Fjallby are two players the Capitals really like, and both are likely in Hershey’s opening night lineup. Also up front, Beck Malenstyn, Max Kammerer, and Brian Pinho should be with the Bears. Russian Sergei Shumakov was just signed by the Capitals and it’ll be interesting to see where he winds up. You’d have to think with his success in the KHL in Russia, that he makes the NHL squad. However, he did sign a two-way contract, and does NOT need waivers to come down to Hershey, so he could be a Bear as well. Defensively, Hershey should return all the young defenders from last year, unless one surprises in training camp. Who's slated to be our top D pair? How does the veteran D signing impact the D core in general? Who will play up top on the PP? On the PK? I’d put Tyler Lewington and Aaron Ness as likely your top defensive pair. Ness was great in both zones last year, and Lewington, when on his game, is tough, and solid all-around. Certainly, big sophomore seasons from Lucas Johansen, Connor Hobbs, and Jonas Siegenthaler are needed. Anyone of them could quickly jump into a top pairing spot. I think Logan Pyett, the veteran defender signed last month, will push for a spot on the Bears. It’s not guaranteed, as he missed all of 2015-16 and 2016-17 battling cancer, and just returned to the ice last year in Asia. However, if he returns to form, he was a really good defender during his time in the AHL, and is a great leader. He could be sent to South Carolina if he needs some time to get going, but the Bears believe he can battle with a guy like Kris Bindulis for playing time as one of the team’s seven defenders. It’ll be interesting to see the defenders on the power play and penalty kill once Spencer Carbery gets settled in. With the departure of Ryan Murphy and promotion of Reid Cashman, all is a bit unknown as of now. Other than Barber where do you see the Bears scoring coming from this year? Do you see them bring anyone in on a PTO during camp? Both Michael Sgarbossa and Jayson Megna have had good success at the AHL level offensively, and the Capitals signed them to be strong performers for the Bears. Both are veterans, and Megna is a former 26-goal scorer in Wilkes-Barre/Scranton with leadership qualities. He has always seemed to play well versus Hershey. Sgarbossa had a nice season in Manitoba last year with 40 points, including 16 goals. Those two guys are just pieces of the puzzles on offense. It’s no secret it’ll be the youth that really has to come to play this year. Garrett Pilon had an impressive stat line in juniors that has to translate to the pros. Juuso Ikonen was a big scorer overseas, and the Capitals see him as a top-6 forward in the AHL. If he’s here, Shane Gersich should be one of the top offensive threats. Mathias Bau will need to improve on his 13 goal rookie season. With youth, there are a lot of unknowns. However, this is a good group of prospects coming in. With no offense to the rookie forwards on the team last year, this is a more gifted group offensively than the likes of Mason Mitchell and Hampus Gustafsson. I compare it more to the likes of Riley Barber and Travis Boyd coming in during the 2015-16 season. At the time, both were unproven. In fact, the Bears coaching staff had Travis Boyd as the team’s 4th line center on the summer depth chart before his rookie season. There was even talk about him starting in South Carolina. However, he came in, proved himself, earned the ice time, and posted 53 points in his rookie season. Now he’s an NHL’er. Hopefully, several of these young players will be able to be relied on as top-6 talent that can put the puck in the net. We now look at Barber and Boyd as accomplished players, but at one point they were just unproven kids too. As far as PTO’s go, the Bears will bring in a few guys to look at. I still think, if the right situation presents itself, the Bears would like to add a veteran forward. There are some good longtime NHL players still out there that might be looking for an AHL deal if nothing formulates for them as far as an NHL contract goes. It should be interesting to follow over the next few weeks as we approach the start of the season. How do you see the goaltending situation playing out over the whole season? Copley is unproven as far as NHL goes and could face pressure from a strong AHL performance by Vitek or Samsonov. Pheonix Copley will be Braden Holtby’s backup. Vitek Vanecek and Ilya Samsonov will be in Hershey. This is the plan, unless something changes in training camp. Copley has only played two career NHL games, so you are right, he is unproven. He’s on a one-year, one-way contract that sees him make $650,000 no matter if he’s in the NHL or the minors. If he were to be sent to Hershey, he’d have to clear waivers. While Copley’s numbers weren’t great on a struggling Bears team last season, it was clear his injury, and late start to the season really slowed him down. 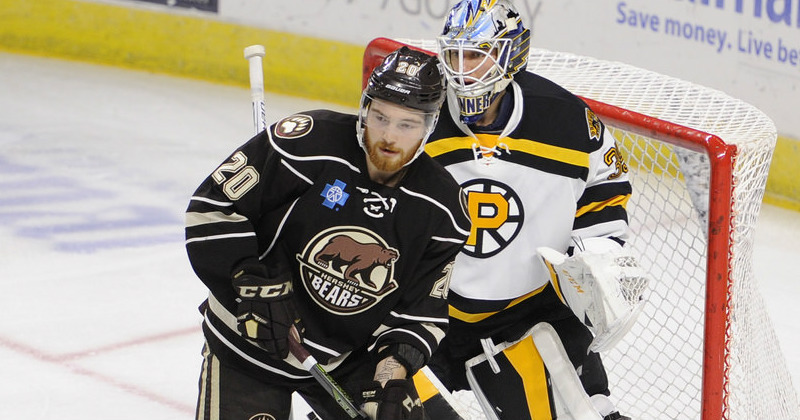 We saw what Copley could do during his rookie season in 2014-15, and he was the main reason Hershey qualified for the playoffs with his stellar play once being reacquired during the 2016-17 season. Scott Murray, the former Bears goaltending coach who is now in Washington, is the one responsible for the rise of Pheonix. He saw him play at Michigan Tech and pushed the Capitals to sign him. Murray helped Copley become a great AHL goalie. If anyone can make Copley into a great backup behind Holtby, it’s Scotty. If Vanecek, or more particularly Samsonov, are playing exceptional in Hershey, and Copley struggles, sure the Capitals could look to make a swap of goalies in the organization, pending Copley cleared waivers. Hopefully Copley will play like we know he’s capable of, because Samsonov is clearly the Capitals goaltender of the future, and getting a great deal of starts while learning the North American game in Hershey will really benefit him. While he put up eye-popping numbers as just a kid in Russia, this is the next level. Before we go, I wanted to say welcome back to Hershey to Matt Trust. He’s been added to our staff as a Media Coordinator. You probably know Matt from hosting Opening Faceoff with myself. He did a great job in his three years as an intern, and he’ll really help us add content to our social, web, and in-game platforms. I am looking forward to a season with a lot of new faces. This time of year is one for excitement. I know last year was one of the poorest years statistically for the Bears in a long time. Come the opening of training camp, that’s all in the past as we start the drive for a 12th Calder Cup under new coach Spencer Carbery. I look forward to seeing what this talented young group can do to put on a show for the best fans in the AHL. Is it October yet?